\The Securities and Exchange Commission recently revoked Rappler's corporate registration after the latter violated the constitutional prohibition on foreign ownership and management of mass media, among other laws. All Liberal Party officials and their bleeding heart supporters immediately decried what they believe to be an attack on Freedom of the Press, despite the fact that Rappler indeed ceded control of its operations to foreigners, something that's expressly forbidden by Philippine Law. I think these bleeding hearts need to look not too far back in history, when a president -- that they so admire -- DIRECTLY attacked Press Freedom herself. In 1987, Philippine Star columnist Luis Beltran wrote that President Corazon "Cory" Aquino hid under her bed during a coup d'etat. Incensed, Aquino sued Beltran and the Star for Libel, and Aquino even went as far as showing journalists that she couldn't fit under her bed. 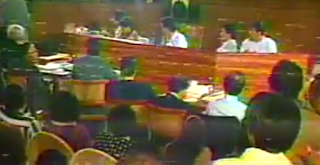 Beltran, who openly criticized Aquino for her incompetence, said his words should not have been taken literally. Nevertheless, Beltran and the Star issued groveling apologies to the President Aquino for the supposed misunderstanding. Aquino didn't accept Beltran and the Star's apology. She still pursued the case, with her even sitting on the witness stand WHILE SHE WAS STILL THE PRESIDENT OF THE REPUBLIC, as shown in the accompanying video clip. The court ruled in favor of Aquino in 1992, sentenced Beltran and Star Editor Max Soliven to 2 years in prison, and ordered them to pay Php 2 million in damages. The Duterte Government's issue against Rappler is about foreign ownership, which directly affects National Security. Meanwhile, the Aquino Government's issue against the Star is about defamation, and issue that Star has apologized for, an issue that affected nothing but Aquino's fragile ego. The Duterte Government simply rescinded Rappler's corporate registration, which does not prevent Rappler from covering Malacanang. It is a mere administrative case that involved no jail sentences and no fines. Meanwhile, the Aquino Government -- through no less than Cory Aquino herself -- aggressively sent two journalists to jail. Should Pres. Rody Duterte sue Rappler's Pia Ranada Robles just like how Pres. 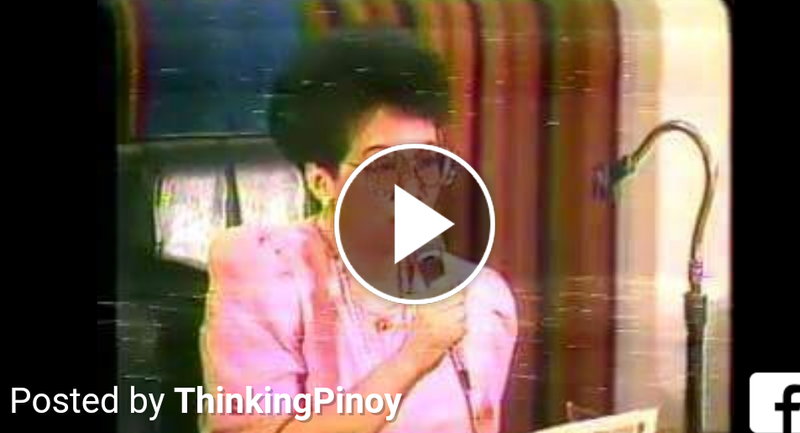 Corazon Aquino sued Philippine Star's Luis Beltran while she was still president? Isipin mo ha, ang sinabi lang ni Beltran e nagtago si Cory sa ilalim kama. Meanwhile, ang sinabi ni Pia e nangungurakot si Christopher Bong Go and by virtue of his being your alter ego, e nangungurakot ka rin. If there's a government that really directly attacked press freedom, it's the Government of Cory Aquino, the Government of the person that the Yellow Bleeding Hearts adore. Merry Moussey: Evil of all evil disguised under the halo of catholic priests. Nadeceive pati ako at sambayanan ng mga evil na ito .akala natin mabait , may takot sa Diyos un pala mas higit pa ang pinaggagawa sa kapwa. Hanggang mamatay sila they will always think they have been good. Kasi i nga may kulang sa pagkatao nila. Un ay ang KONSENSIYA. Jefferson Balsacao: I theoretically assume on how FVP Leni Robredo will react on both issue. SEC VS Rappler : I hope the current government uphold the constitution , uphold the Freedom of the press. Cory Aquino VS Luis Beltran : Cory is just defending herself from false accusation, let the media be mindful on their job.. yada yada yada.. Double Standard, The LP Standard! This video shows how Aquino doesn't want criticism. Rosemarie Astorias: Ibang iba talaga ,kaya,kayang bolahin ang mga tao nuon kasi tv at radyo lang ,puwedeng bagohin ang katotohan ,at yong mga maririnig sa radyo at mapapanuod sa tv ay kayang baliktarin,ang tama gagawing mali at ang mali gagawing tama at yon ang paniniwalaan ng tao.parang sila ang diyos sila ang magdidikta sa bawat isa ..now iba na may social media ,dito may totoo at mayron ding hindi pero atleast makikita mo at ikaw mismo ang magpapasya kong sino ang paniniwalaan mo sa dalawa.kasi hindi mo lang naririnig nakikita mo pa..godbles pilipinas. Nerissa Arias Donato: According to one article written by Cito Beltran, Louie Beltran's son, they lost everything because of what Cory did to his father. Not just their properties because of the expense incurred during the trial, but also their friends in the media. Beltran wrote for PhilStar...and yet, the owners did not help him because this paper owed its existence to Cory Aquino.